The World Health Organization today admitted to an unusual procedure to set up a debate on the health implications of a UN treaty on sharing of benefits from genetic resources. The new agenda item proposed by the WHO director general was accepted by the WHO Board today, but with member states questioning the governance of the move. The WHO Executive Board is responsible for approving the agenda of the World Health Assembly held annually in May. The dates of the next WHA were set today from 20-28 May. The new agenda item proposed by WHO Director General Tedros Adhanom Gheyebresus (Dr Tedros) is on the public health implications of the implementation of the Nagoya Protocol on Access to Genetic Resources and the Fair and Equitable Sharing of Benefits Arising from their Utilization to the Convention on of Biological Diversity. The agenda item was adopted by the 144th WHO Executive Board which concluded early today. The Board met from 24 January to 1 February. The agenda item was already reflected in the draft World Health Assembly (WHA) agenda [pdf], but as a footnote to the PIP Framework item (12.1 – Other Technical Matters). The Brazilian delegate, supported by China and Indonesia, questioned the secretariat on the date of the submission of this proposal, and why a proposal by the WHO director general would appear as a footnote in the draft World Health Assembly (WHA) agenda, and refer to a recommendation from an Advisory Group to WHO Pandemic Influenza Preparedness (PIP) Framework. The issue of the public health implications of the Nagoya Protocol implementation is discussed in the context of the PIP Framework, regarding the sharing of pathogens, with no consensus on the question. Further consultations are expected to be organised until the WHA in May and Brazil suggested to wait for the result of those consultations. WHO Legal Counsel Steven Solomon took the position that the agenda item proposed by the director general solely concerns the Nagoya Protocol, as the PIP framework already has its own agenda item. According to Solomon, the secretariat was faced with the question on how to bring that recommendation, which was supported by the director general, to the consideration of the Board. It was in the end added as a footnote. “It is not the ordinary way, but it is consistent with the rules of procedure,” he said. The United States, Germany, Finland and Norway (which is not a Board member), supported the agenda item proposed by Dr Tedros, while Indonesia and China supported Brazil. PIP Advisory Group – Overstepping Role? “From a good governance perspective, this is not a good practice,” the Brazilian delegate said after Solomon’s explanation. The footnote to the agenda item on PIP “gives the legitimate impression that the discussion is related to PIP,” he said. “From a purely [governance perspective] this is not good. At all,” Brazil said. The PIP Advisory Group “might be overstepping its mandate” with this recommendation, Brazil added. Solomon responded, “We agree with the point that Brazil strongly made that this is not a good way to go forward and we take very careful note of that.” He also noted that a lot of member states in the room seemed to nod their approval of Brazil’s point during the discussion. On the issue of governance, Brazil was supported by Germany and Finland. 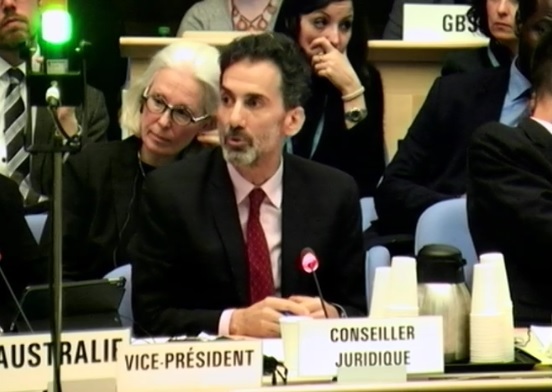 "WHO Governance Questioned As It Adds World Health Assembly Agenda Item On Biodiversity" by Intellectual Property Watch is licensed under a Creative Commons Attribution-NonCommercial-ShareAlike 4.0 International License. “Human Pathogens as Capstone Application of the Economics of Information to Convention on Biological Diversity”, Joseph Henry Vogel, Claribel Fuentes-Rivera, Barbara A. Hocking, Omar Oduardo-Sierra, and Ana Zubiaurre, International Journal of Biology, Vol 5, No. 2: 121-134. April 2013. Support was provided by the Linkage International Grant of the Australian Research Council (LX0881935).